Feuds, Knitting and Wisconsin Cheddar! It’s heating up in Los Angeles, literally – boo, and heating up in a new steamy commercial promoting audiobooks! Click on the picture below to see the new spot debuted on USA Today! 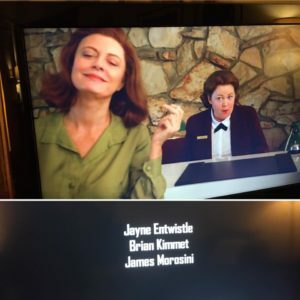 One of the most exciting things to happen so far this year was a Guest Star role on Feud, the new series from Ryan Murphy of American Horror Story Fame. The FX series follows the infamous feud between Bette Davis and Joan Crawford while they were filming Whatever Happened to Baby Jane. My part was small but the impact on me was enormous. My scene was with with Susan Sarandon, Jessica Lange and Jackie Hoffman! What a terrifying thrill. My participation aside, it is a fantastic series and a stark and scathing commentary on the role Hollywood has and continues to play in the undermining of Women. A must watch!!! Thanks to the generosity of Sharon Grover and The Beloit Public Library in Beloit, Wisconsin, I attended the first ever AudioCon – a day of all things involving the spoken word. I was accompanied by the erudite Mr. Dion Graham, the narrator of My Name is Not Friday, X, and The Greatest, to name just a few. We each spoke in the library, where the festival was held, about the ins and outs of narrating audiobooks and were judges in the festival’s version of The Voice, a competition where participants read excerpts from books to determine who had the best voice. It was a wonderful trip filled with heart and…cheese, of course! I have just completed narrating two wonderful books I am very excited about. The first is a reunion with one of my favourite authors, Julie Berry! I had the great honour of narrating two of her previous books, The Scandalous Sisterhood of Prickwillow Place and The Passion of Dolssa. Julie Berry returns with, The Emperor’s Ostrich. 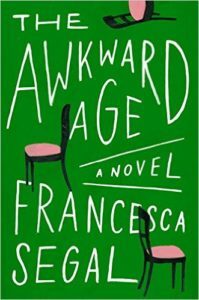 The second book I just completed is called, The Awkward Age by Francesca Segal. A wry, tender novel about an ordinary family facing extraordinary choices. Feel free to drop me a line on the contact page, I love hearing from you and thank you for popping by, it’s always lovely to see you.